Folder сolor сhange will speed-up your computer work! Why? Many folders in one directory can be a problem, especially when it comes to searching for a particular folder in a hurry. Having color-coded folders makes it much easier to find the needed one and you don’t waste your time at unnecessary search. This free icon set includes any colors you may wish to color folder. Starting from Red and finishing by Black. Download Folder Color Icon Set NOW! This is standard Windows way. The way is needlessly complicated as users have to go down a long ‘click-and-open road’ through Windows dialogs before they can actually change the icon folder. We know better way. It’s named Folder Marker and it tackles the too-many-folders problem in a more elegant manner than Windows tools. 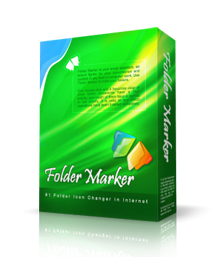 As the name implies, Folder Marker uses a marker metaphor to make some folders easier to find. After installing it, you work as you normally do. When you want to customize some folder to make it more prominent than the others, you simply right click on it, select Folder Marker and select an icon that may be a folder icon of some specific color (red, blue, green, etc) or a folder icon with some image on it that symbolizes its purpose. On selecting, the icon is applied to a folder instantly. Instead of 8 operations to customize a folder, you make 2 – that’s a big difference because you can apply the icon of a folder almost without interrupting your computation.